The PortfolioTrader simulation enables participants to gain valuable knowledge and experience in the process and execution of portfolio trading. The participants are given a certain (fictive) amount of capital which they can invest in a variety of securities. The goal is to maximise returns while adhering to their client’s portfolio objectives and balanced trading risks. 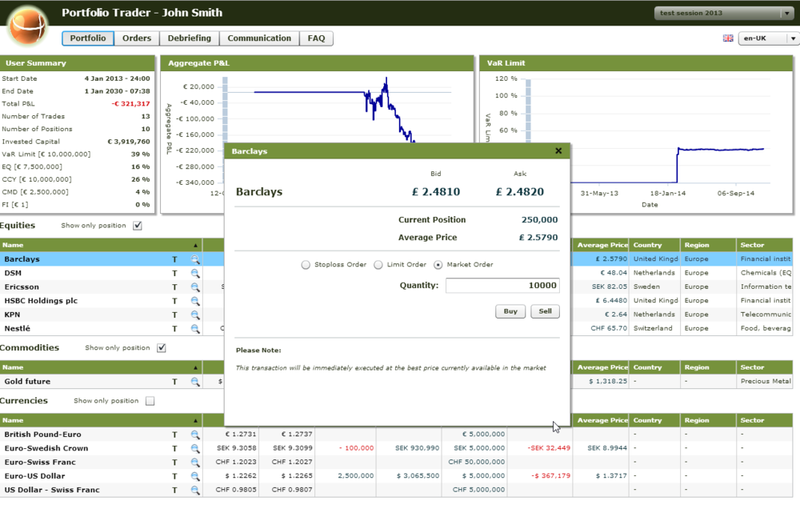 The PortfolioTrader simulation uses real market instruments in a real-time environment. The participants will get the opportunity to experience which market theories work as expected and what happens when a theory breaks down in practice. They gain an in-depth understanding of market dynamics. The participants in the PortfolioTrader simulation need to create and follow (their own) market expectations as well as experience the emotions involved in managing a portfolio of real instruments in real-time. The PortfolioTrader simulation is internet-based and runs ‘live’ (either with a 15-minute delay or real-time) over a period of days, weeks or even months. The length of a PortfolioTrader simulation session can vary considerably depending on the experience of and time available for the participants. A typical session lasts between three to eight weeks. A standard session would require either one hour of e-learning or a classroom presentation before the start of the PortfolioTrader simulation. After a PortfolioTrader simulation session, the (optional) group feedback takes on average two hours. Individual feedback can range from ten minutes to two hours per participant depending on the required depth of coaching.